"A brilliant and thoroughly modern guide to learning new languages. Fluent Forever won’t teach you French, or German, or any other language — but it will teach you how to learn whatever language you do want to learn, and to learn it faster, and more efficiently. If you want a new language to stick, start here." Angelika's site is a wonderful resource for any German Learner: From online German tuition, to translation advice, reviews of other learning methods and sites, links to other language learning resources, relevant and motivational blog posts: If you want to learn German, Angelika's is the site you should bookmark and use! 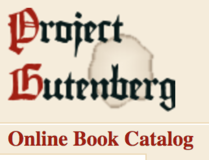 Project Gutenberg is an amazing site for language learners. Not only will you find books in dozens of languages, but also quite a few audio recordings. All are in the public domain and free to use. Many of the books are older with expired copyrights, but you'll be amazed what you can find! 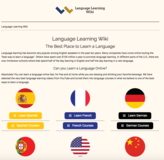 Languagelearningwiki.org, founded in 2016, is a great way to accelerate your language learning. It currently offers 10 languages and is completely free. Just sign up and dive into the language you always wanted to learn! For many of the languages there are Courses, Real Life conversations, and ways to learn with music or movies. Clozemaster is an online language learning game designed to build vocabulary by filling in the blanks ("clozes") of sentences. It starts with the most commonly used words and sentences and gets more obscure as you progress. All of the sentences are pulled from real-life used sentences. This is aimed at intermediate language learners and those experience a "language learning plateau". We offer over 50 different languages and language pairings - you can learn Dutch from Japanese, Greek from Spanish, or Chinese from Arabic for example, so the possibilities are quite endless and it works for native speakers of any of our offered languages, not just English.